Here is another of our salad stable! A great way to use up ingredients and keep healthy, too. Andrew: There are similarities to the spicy chicken salad here. Dawn: With a more Mediterranean touch, too. Andrew: We have used the giant garlic croutons, again. Dawn: Those would be excellent in a soup! First make your giant croutons. 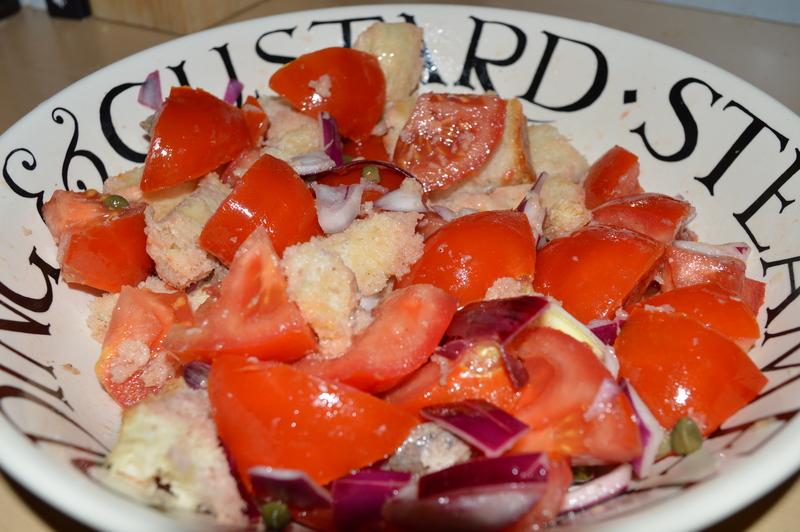 Slice the ciabatta into 1 cm slices, cut the garlic in half and rub the cut side on both sides of the bread. Fry these gently in a little olive oil until golden on both sides, and set aside. In the same pan fry the chicken and aubergines, with the chilli flakes, until thoroughly cooked. You may need to add a little more oil, or if you want a healthier option, a spoonful or two of water. Allow the aubergine to turn golden and soften up. 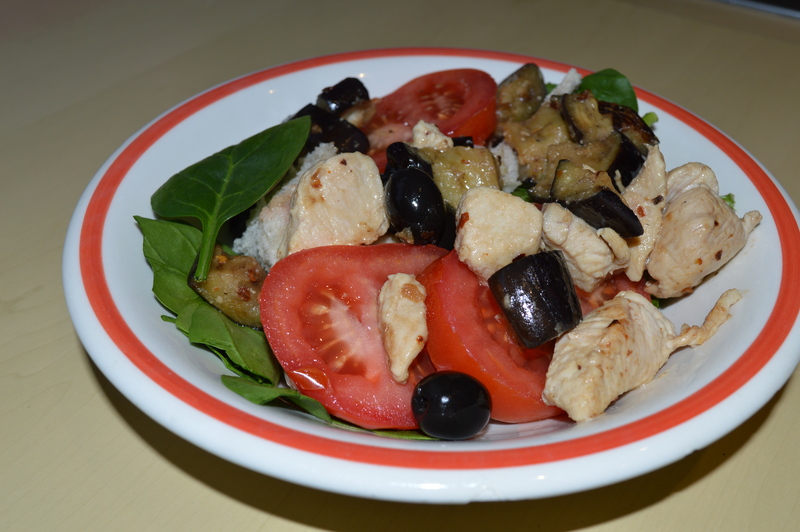 In your salad bowl, arrange the spinach, croutons and olives, then give a good stir with your fingers to mix everything up. Slice the fresh tomato, and lay slices alternately with pieces of sun dried tomato. Add the chicken, season with salt and pepper, and if you wish drizzle some of the oil from the sun dried tomatoes as dressing. Andrew: This was superb served fresh! Dawn: And equally as tasty the next day in a lunchbox! Andrew: The garlic really infuses into the bread and aubergine, and develops its flavour into the next day. Dawn: Great for busy bees! For more handy hints and tasty treats, and actual alliteration, keep following forfoodlovers.wordpress.com and our Twitter feed @Love_Food_UK and on Facebook Lovefood Forfoodlovers where it would be great to get more likes! This is one of the easiest and most economical dishes we know. 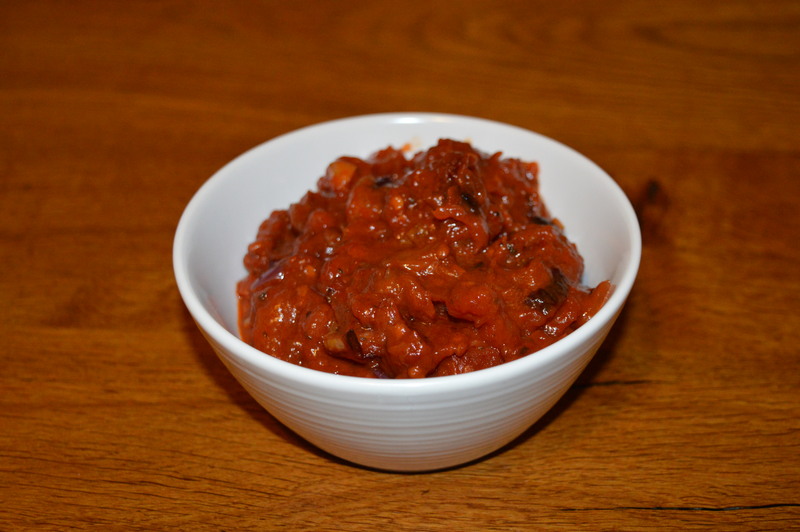 It can be produced using store cupboard ingredients, and is incredibly flexible, served as a pasta sauce, on top of rice, as a pizza topping or as an alternative to ketchup with fish or steak. Dawn: Is this another of your student specials? Andrew: It is! By seeking out the discount ranges, a meal for four can be produced for about a pound! Over a medium heat and in a little olive oil, cook the onion for 5 minutes until it turns translucent. Add the garlic, chilli and basil and cook for a further minute. Now pour in the tin of tomatoes and turn the heat to a low simmer. Stirring occasionally, allow the sauce to thicken over half an hour or so. This will allow the flavours to develop and the sauce to turn a deep shade of red. When cooked it can be served as warm with pasta, or allowed to cool it can be used as an accompaniment. Dawn: Can we be flexible with the herbs and spices, too? Andrew: We can. Whatever is to hand can be used. If we were Italian of course we would be using fresh ripe tomatoes! Fabulous ideas abound at https://forfoodlovers.wordpress.com and the Twitter account @Love_Food_UK as well as our Facebook and Mumsnet links.